UNIT and it’s TV & Film Division, UNIT Studios, delivers post production on Sky Atlantic’s epic new drama Britannia. UNIT and our TV & Film Division, UNIT Studios are very proud and excited to have collaborated on Sky Atlantic’s epic new historical drama BRITANNIA which was released on Thursday 18 January 2018. With an award-winning cast and billed as one of Sky’s most ambitious series yet, the 9-part drama set in 43AD is sees Sky and Amazon Studios join forces for the first time in a co-production with Vertigo Films in association with Neal Street Productions. Handfasting and a Druid Initiation Ceremony. Some studios might have been fazed by this but we knew we had a really strong team and were definitely up for the challenge”. UNIT’s VFX Supervisor, Nuno Pereira, oversaw the production from start to finish over four months and managed a streamlined pipeline with efficient workflows for a 3.2K ACES delivery. In light of the logistics, it was decided that the teams would be split and run in parallel. With Nuno overseeing the whole of production comprising 23 artists, Creative Director Alon Ziv led a splinter team of two concept artists and one of UNIT’s in-house editors, Scott Ryan, devoted to creating the Underworld. Nuno notes, “In the beginning, no one really knew what the Underworld was or what it was supposed to look like. It was an inherited sequence of loosely scripted dramatic performances by the actors, which had been shot against blue screen several months earlier catering for a simple line in the script which had read (we paraphrase here) ‘Divis goes into the Underworld’. So, from a storytelling and editorial point of view there was a lot to be done. In creating the Underworld environment Alon says, “The first challenge was to come up with a look and feel which clearly defined it. It somehow needed to be a mix between a drug-induced hallucination and a believable location. It was important to keep the reality of the Underworld vague because for the characters it’s a real place that changed and evolved every time the characters visited it, and what happens there has consequences in the real world. Nuno adds “Once concepts were approved, these shots were taken into production. Due to its nature, it ended up being a full VFX build with every shot, except for the actors, being fully computer generated. Our creative team worked on creature animation and simulations for the snake, with atmospherics and textures added in the smoke simulations and finally compositing”. Scott Simmonds, one of UNIT’s Lead Nuke Compositors notes, ‘The biggest and most exciting challenge for me was bringing the 2D matte paintings to life, adding lighting, atmospherics, camera moves and parallax. The next challenge was then embedding our blue screen actors into the shot especially when the lighting was completely different. We had to really go in and mask off different body parts to either lighten or darken them in order to make the actors feel like they were shot in situ”. On grading the Underworld sequence, UNIT’s Colour Team enhanced the otherworldly graphic feel with strongly saturated and desaturated tones. In the end, UNIT created four sequences for the Underworld with around 100 shots in total. UNIT led and carried out all post-production: from concept art, to direction and editorial, FX, creature work, compositing and final grade. Meanwhile, back in the ‘real world’, and the drama of 43AD, the second VFX team was working on two other sequences. The first, a Druid Initiation Ceremony, where they were tasked with creating an optical Lensbaby effect. Parts of this sequence had been shot in camera but the remainder needed to emulate the shallow depth of field, stronger centres of focus and the distorted outer edges of the effect across some 80 shots. The other sequence was Handfasting. 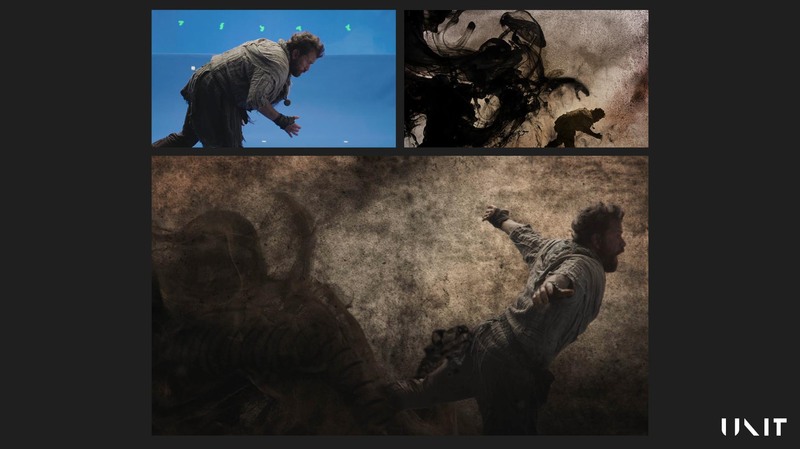 Nuno comments, “This was a VFX heavy scene which incorporated a lot of invisible VFX over five minutes. This ritual marriage ceremony quickly turns sour and a battle ensues. Since this sequence was actually shot at different times, different days, with different lighting conditions it needed extensive work to create one seamless sequence. We were tasked with matching all the skies and the environments, then added smoke to the atmosphere (foreground, mid ground and background) balancing this with the existing smoke shots which had been shot on location. The battle sequence itself, required clean up and removal, as well as the addition of blood, wounds and blood splatter”. On grading Handfasting, one of UNIT’s Senior Colourists Simon Astbury adds, “The biggest challenge was to match together an action heavy scene shot on three different days with four different cameras. To ensure a smooth flow of images in an action scene is difficult enough, but if you add varying weather and camera formats into the mix it becomes very challenging”. UNIT’s Executive Producer Emma Watterson finishes, “The collaborative manner of the project meant we had the clients trust throughout, which was a brilliant position to be in. We are all incredibly proud of the work on Britannia which has certainly pushed us creatively, especially with such a volume of work in such a short space of time, and raised the bar for the future VFX work we want to produce across the whole spectrum of TV, Film Commercials and Content”.